1. Talking to an auto injury lawyer can cost a huge amount of money and moreover, it will be costly to hire an auto injury lawyer. Truth: Talking to an auto injury lawyer is free of cost and also, it doesn’t cost much to hire an auto injury lawyer for a case. 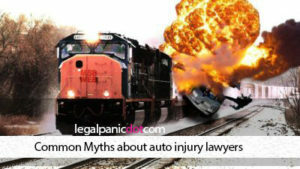 There is a common myth about auto injury lawyers that charges of auto injury lawyers are high. This started because of different types of charging the services by different lawyers. These charges can be referred to as “fee structures.” So, hiring lawyers for cases like a divorce or some criminal offence usually costs a good amount of charge and thus, is expensive. Because of this reason, people think that hiring an auto injury lawyer is also difficult to afford. In auto injury law, a good majority of lawyers use a fee structure which is contingent in nature. With this type of fee structure, the attorney or lawyer agrees to join your case without any charge. After the case is closed, the fees are deducted. But, the important part is that the fees can be deducted only if you win the case or the settlement is done in the court. 2. If I get injured, the insurance which I have done will cover almost all my cost. Truth: Insurance companies will pay the least amount possible to you to dismiss your claim. The people who are working in the insurance industry seem to be good, but it is also a fact that insurance companies are concerned with only one thing, that is, their bottom line. The injuries from cars are one of the common reasons that people file auto injury lawsuits. Every year, the insurance companies pay around 51% of the costs which are associated with crashes of motor vehicles and cars, while crash victims pay around 27% of the crash costs from their pockets. So, even if you have insurance, you ought to pay a lot from your own pocket and it could be a huge amount even if those injuries were the outcome of other’s carelessness. That is a fact, though it’s not fair. 3. There is a good amount of time to report to a lawsuit if it is needed later. Truth: When you are injured, the time limit starts. After two years, you are unable to file an auto injury lawsuit. In free consultations, it has been seen that clients file the lawsuit for their injuries after a long time. Two years, which seems a good amount of time, go faster. If your injuries are minor but get worse day by day, it is really easy focusing on the reason for what’s being wrong and then finally settling it. The last thing that most people think is to file a lawsuit. Though there seem some conditions when you are allowed to extend the time for filing a lawsuit, it is limited as well as complex. It stands out as one of the reasons why it is necessary to consult an auto injury lawyer if you get injured. Crystal J.Pace is a Professional legal writer and have worked with many companies. She is associated with West Coast Trial Lawyers, Top Car Accident Lawyers.